Dealerships that Chrysler LLC wants to close view the used-car business as their main option. More than half plan to convert their stores to used-car operations, according to a nonscientific e-mail survey conducted by Automotive News last week. The survey had 53 responses from dealer principals. 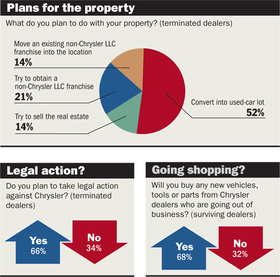 Asked about plans for their property, 52 percent plan a used-car operation. The next-largest group, 21 percent, said they will try to obtain a new-vehicle franchise from another automaker. One responding dealer, Michael Comiskey of Orleans Dodge-Chrysler-Jeep in New Orleans, sees used cars as a last resort. "I'd rather not visit that, but if we have to, we will," he said. Comiskey said he will join legal action organized by the National Automobile Dealers Association to block Chrysler's plan to drop the franchise agreements of 789 dealerships. "We're sending off the check for that today," he said Friday, May 15. On June 4, Judge Arthur Gonzalez is scheduled to hear objections to Chrysler's plan in U.S. Bankruptcy Court in New York. In the survey, 66 percent said they plan legal action against Chrysler. But dealer David Waikem of Waikem Chrysler-Jeep in Massillon, Ohio, sees little chance of stopping Chrysler from yanking franchises. "The way this is going to play out, I think this is a false hope," Waikem said. "The advice I'm getting is that it's going to be a losing battle." Waikem is fortunate in one respect. A nearby Dodge dealer that will add Chrysler and Jeep franchises will buy his new-vehicle inventory and parts. "We have a great relationship -- his father did business with my father," Waikem said. "They know us. They know they're not going to get stuck with a bunch of bad parts." Among surviving dealers answering the survey, 68 percent said they plan to buy new vehicles, tools or parts from dealerships that close. Chrysler has said it will not buy back inventory or parts from stores it is shedding. -- 79 percent of surviving dealers said they plan to order new vehicles from Chrysler within three months. -- 86 percent of nonsurviving dealers said they have 100 or fewer new Chrysler, Jeep or Dodge vehicles in inventory. -- 72 percent of nonsurviving dealers plan to sell some of their inventory to other dealers.